Content gets complicated. We enable smarter marketing. Content is slowly taking over the world. Blogging, hailed as one the easiest ways to produce original content for your site, is something marketers everywhere have been shouting about for a while now. But the process of producing, publishing and promoting your content isn’t always easy. In fact, it can be outright challenging. With your team, you must come up with original, shareworthy ideas, identify and recruit a talented writer, and then market your content as if your life depended on it. Indeed, blogging is no walk in the park. To simplify the way you do content, here a few tips that will help with one of the hardest initial processes: coming up with ideas. Remember that old saying, “a picture is worth a thousand words”? Photographs, while excellent, offer only one opportunity to provide compelling visuals for your readers. Video, custom images and infographics also help you engage your audience. Check out this infographic by ChairOffice. ChairOffice sell chairs and office furniture — easily a “boring” niche (sorry CO!). 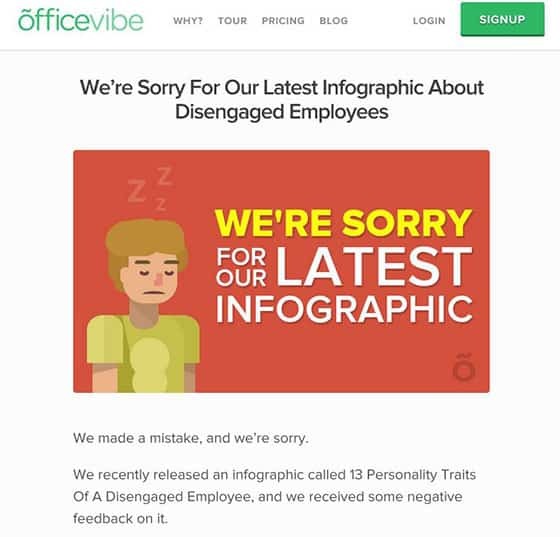 But the infographic made its way onto Mashable and Entrepreneur and has been shared over 20k times. First is because the content had nothing to do with office chairs. 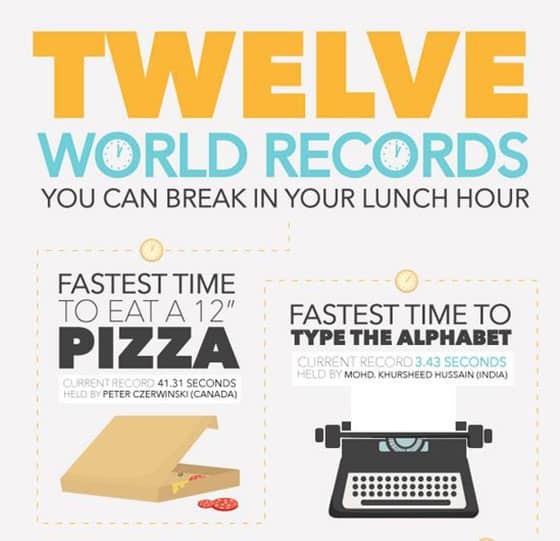 It was called 12 World Records You Can Break In Your Lunch Hour — a KILLER headline that instantly grabs readers’ attention. Second, it was visually engaging. The CO team condensed all the information into an easily read ‘fact file’ — which made it wildly shareable. If your blog is post-after-post of long prose and the occasional stock image, you’ll want to consider adding an occasional infographic into the mix. Use real people in your videos to create intimacy and a connection with your audience. Use infographics or comic-strips to present information differently. Use photographs to tell a story. Try a “How to” post using predominantly photos (or gifs), or use a gallery to share your brand’s story of growth. Everyone craves information, whether they consciously think it or not! We are driven by a thirst for knowledge — whether to get better at what we do or simply to show off in front of peers! And someone, somewhere, wants to know more about your industry or niche. It doesn’t matter what product or service you offer — you will always have a potential audience and customer in mind. Think about your customer, and brainstorm things they want to know. If you sell a product, don’t just tell people about that product. Instead, tell a story about the entire process. Provide a checklist, a resource, or a guide. Give your buyers the opportunity to become ‘experts’ in the niche too. Remember to think outside the box. MyBedFrames sells beds and mattresses. That’s it. But they wrote this blog post about decorating because they realized their target audience is interested in interior design. People always want to learn more. Check your support page and FAQs for ideas about topics that concern your customers. Compose a detailed and well-researched answer for each of their biggest questions, and turn each one into a new blog post. Soon enough, you’ll find yourself blogging about genuinely helpful and useful information. But, more importantly than that, it will show your clients that you are actively listening to them. Talk to your customer relations and sales team, and find out what questions you get asked the most. Use sites like Quora to search for questions people are asking. Once you have written a blog post, you can respond to those questions and link back to your newly published article (and drive targeted traffic). Create small surveys and get your clients to answer them. Use that data and feedback to produce killer content your readers will love. There is nothing wrong with highlighting some of your best customer reviews on your company’s blog. Just try not get into the habit of ONLY featuring positive reviews. No business is perfect (admit it! ), and you will come across as self-indulgent and spammy. Invite customers to write a detailed review of their experience. That way you are actively engaging them while demonstrating that you value their opinion. Pick out quotes or ratings and turn them into images. Perhaps you can create a monthly ‘review board’ where you post a handful of mixed customer reviews. With any negative feedback, be smart about how you respond. If you do receive a bad review — and you have done something wrong — author a public apology. As intimidating as it can be, it will work in your favor (Officevibe did it and they came out on top). Go through your old blog posts and freshen them up. When you’re done, re-distribute them letting everyone know they’re still relevant. Revisit old topics and discuss how much things have changed in that space of time — or how things have actually stayed exactly the same. If you have old survey statistics, consider making a new survey and compare the old and new data in an interesting way. When thinking of a blog topic, ask yourself: Will people still read this and think it is interesting a year from now? Ideally, you’d like the answer to be yes. That’s evergreen content, content that doesn’t have a ‘time limit’ and won’t suddenly become old and outdated after a few months. Of course, content like this is much harder to produce. But if you can manage it, it’ll work wonders for your blog (and traffic). Consider subtopics within your niche that are consistently talked about. Try writing a beginner’s guide — there will always be people new to your industry. There seems to be a reluctancy in every business when it comes to giving away free value and insight. If your blog is relatively new, then a competition is a great way to build up an initial subscriber and follower list since no-one can resist free stuff (especially if it’s something really, really good). Give away a new or popular product or service in a competition — but make people sign up to your newsletter to enter. Offer up a product or service in exchange for a review. Share your expertise and assert yourself as a reputable and authoritative source. Divulge some of your best secrets. There is a huge theory that giving away free advice is detrimental to your business — that people won’t pay for your products or services if you give them away for free. To that, I say, it depends on your business. People are always going to use a digital agency like the one I work for, because they do not have the appropriate in-house resources to do it themselves. By sharing my knowledge with you, do you think you would be more or less likely to use my services in the future? Guest blog on influential sites within your niche. Write an incredibly useful guide. Be specific, don’t be too general. Share industry secrets — especially if your competitors haven’t been talking about it. You’ll come across as honest, authoritative and more professional. BONUS: Remember, at least, this one tip when it comes to blogging for your business! You are not writing for you. You are writing for a specific audience. Identify who that is and then put yourself in your reader’s shoes. What would you want to read about? What are you likely to share and why? Think through these questions every time you write a new blog post. You’ll have SEOs telling you to think of keywords first. DON’T. Place your audience on a pedestal and write with them in mind. When you’re done, pass the post along to an SEO expert to read it over. Soon enough you’ll be able to produce world-class content — and that’s how you’ll stay ahead of competitors in the long run. About the author: Louise Dickens works in Content Marketing/Digital PR for digital agency Aptitude. Bloggers: Want to write for Shareaholic? Welcoming all contributors! Developers and marketers: Start your career with us. Join Shareaholic.